How to Sync Music, Videos, Ebooks, Bookmarks, Notes and Photos from Old iPad to the New iPad Pro ? Apple have released a totally new iPad - iPad Pro at Apple's Worldwide Developer Conference this year. This extra-large iPad Pro is a new 12.9-inch tablet as thin as the iPad Air and powered by the new A9x 64-bit chip. Running on Apple's latest software, iOS 9, the iPad Pro will work with a stylus, dubbed Apple Pencil, and a smart keyboard accessory. In addition to Apple's new Notes and Mail apps in iOS 9, Adobe and Microsoft Office suite apps, including Word, Excel and Powerpoint, will be available for the iPad Pro with integrated support for the Apple Pencil. The Apple iPad Pro will be available in silver, gold, and space grey colors in November. As far as pricing goes, pricing starts at $799 for the 32GB model, $949 for the 128GB model, and $1,079 for the 128GB LTE model. Of course, the accessories are sold separately, and the Apple Pencil will go for $99, while the Smart Keyboard will sell for $169. Get ready to switch to the new iPad Pro? Are you ready to buy a new iPad Pro? Here are some tips to sync photos, apps, notes, apps, bookmarks, music, videos and more from your old iPad 1/2/3 or iPad Air 1/2 to the new iPad pro. Although Apple have its own iOS data transfer tool for iPad, iPod Touch and iPhone users, some people are still seeking on the Internet for alternatives. The fast , simple and high-efficiency way is always people wanted. 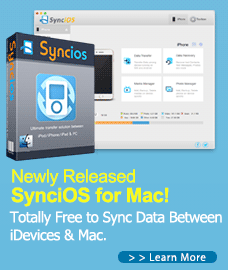 Sync iPad pro via iTunes? Think about data loss! iTunes is one of handy toolkits for iPad Pro data backup and restore. It suppots not only backing up settings, messages, camera roll, documents, saved games, etc, but also online music & apps downloading. However, be careful, iTunes might erase your original phone data while resorting iTunes backup. When talking baout backing up iOS device, i bet that most of people will come up with iCloud at the first time. Yes, iCloud is a convenient way for data backup. After turn on iCloud Backup on your idevice, it will be enabled to backup every time your iPhone or iOS device is locked, plugged to a power source and connected to the internet (Wi-Fi). However, Apple offers only 5GB spaces for free backup. Have more than 5GB data to backup? No money, no backup! Here we recommend you this third-part app - iPad Pro Data Transfer, which is a powerful and professional iOS data Trasnfer, Backup & Restore Tool, supports trasnferring more than 10 types of data from old iPad to the new iPad Pro, including notes, ebooks, calendars, photos, music, videos, apps, etc. Step 1: Download and launch iPad Pro Data Tranfer. 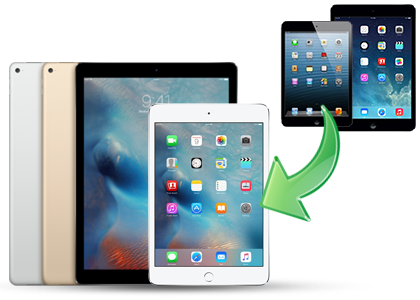 The program will move all data to your new iPad mini 4 or iPad Pro without any quality loss. You can download the Windows version or Mac version, according to your operation system. Step 2: Connect your iPad Pro and old iPad to PC or Mac. Connect your iOS device to PC or Mac and launch iPad Pro Transfer Tool. Then you will see the home page, select Phone to Phone Transfer option to bring up the one-click transfer Panel. Step 3: Select data to tranfer. Once your devices were connected, the program would check all of items automatically on the middle panel, you can also uncheck items you don't need. Simply click on Start Copy. After a while, all of your selected data would be in your new iPad Pro.